Jefferson County was organized by act of Assembly of March 26, 1804, taken from territory belonging to Lycoming County. Young Township, in which Punxsutawney is located, was organized in 1826 and was taken from Perry Township, which was taken from Pinecreek in 1818. It was so-called because Joseph Barnett, the first settler, came from a place called Pine Creek, in Lycoming County. Young Township was the third township organized in Jefferson County and originally included entire southeastern corner of the county. It was named in honor of Judge Young, at that time president judge of the Westmoreland judicial district. The first man to seek a home in the present borough limits was Jacob Hoover, who owned lands which became the borough of Clayville. He pitched his tent beside Gillespie spring in 1813. He built a saw-mill on the "Sawmill Run"that empties into the Mahoning Creek. In 1840, Mr. Hoover built a foundry, which was the nucleus of the Star Ironworks. Clayville was made a borough in 1874, and in 1907, Punxsutawney and Clayville were consolidated. The original site of Punxsutawney was purchased from the Hall and Laird Company by Samuel Findley in 1795, and was sold to Rev. David Barclay, in 1819. In 1822, David Barclay conveyed one-third of the land to Dr. John W. Jenks, his son-in-law. Dr Jenks built a log house on the corner of Penn Street and Farmers Alley, which was the first house built in Punxsutawney, and a son was born to Dr. and Mrs. Jenks, who was christened Phineas, and he was the first child of European descent born in Punxsutawney. Jacob Hoover built a grist mill and carding mill on a site that was later the site of the Gillespie Flouring Mill, and afterwards built a saw-mill on the stream that empties into the Mahoning nearby, from whence it took the name of "Sawmill Run". In 1840, Mr. Hoover built a foundry,. Which was the nucleus of the Star Ironworks. In October, 1818, David Barclay built a log house on the corner of Front and Mahoning streets, which was later the Steam Laundry, which was the second building erected there. In 1820 Dr. Jenks built a grist mill near the mouth of Elk Run, and later a sawmill and tannery. He afterwards erected a commodious dwelling on grounds that subsequently held the residence of Dr. C.W. Hughes. In 1902, William H. Rogers, the leading spirit of the Punxsutawney Iron Company, took the matter in his own hands, employed a competent landscape gardener, and transformed to old Public Square into a beautiful park. The original town site included the section from Front Street to Findley Street and from Farmers Alley to Liberty Street. The lots were 53 by 150 feet, and were numbered from 1 to 76. No 1, corner of front Street and Farmers Alley subsequently was occupied by Wetzel's livery stable. Lot No. 5, on the corner of Front and Mahoning streets, was occupied by Thomas McKee, and was then the principal corner. James Torrence purchased the two squares between Findley and Gilpin streets, north to Torrence Street, and south to Union Street, in 1832 for $75. On the square south of Mahoning Street he erected a dwelling and tannery, which he conducted successfully for many years. William E. Gillespie, one of our pioneer citizens, purchased the square north of Mahoning Street, from Gilpin to Church Street, and from Mahoning to Pine Street, about 1840, and sold town lots from it. The square, from the Winslow Block to church Street, and down Gilpin to Indiana, was purchased about 1832 by John Hunt for a consideration of $190. He had it cut up into town lots, and it was known as "Hunt's Addition". The B,. R. & P. Railroad was completed to Punxsutawney September 30, 1883, and the P. & N. W. Railroad was organized in 1887. The Punxsutawney post office was established in 1826, under John Quincy Adams. Charles, R. Barclay, who kept a general store on the corner of Front and Mahoning streets and who was the pioneer merchant, was the first postmaster. The first school house was built in Punxsutawney in 1822, of round logs, on a lot near the site of the old high school on Findlay which was recently torn down. The next temple of knowledge was as frame structure located on the southwest corner of the Public Square. In 1867 a brick school house was built on the site of the Jefferson Street school. The first physician in Jefferson County was Dr. John W. Jenks, who came here in 1818. His successors, in about the order named, were as follows: Dr. Charles Wood, Dr. Harris, Dr George Kurtz, Dr. A.JH. Johnson, Dr. William Altman, Dr. John Bishop, Dr. W.E.. Allison, Dr, W.A. Means, Dr. Joseph Shields, Dr. W. F. Beyer and Dr. S.S. Hamilton. The first store was opened in Punxsutawney by Charles R. Barclay in 1820, the second by William Campbell in 1832, and the third by John McCrea in 1837. Other early merchants were: B.T. Hasting, John McCoy, William E. Gillespie, George Miller, David Barclay, Stacey B. Williams, John R. Rees, George W. Zeitler, James Dean, John Hunt, John B. Wilson, William Davis, Ephraim Bair, and Dr. Joseph Shields. Although drugs were kept in the early general stores, and a fairly good supply by Rees and Sheilds, the first exclusive drug store was opened in 1880 by J. M Beyer and his brother, Dr. W. F. Beyer. Abram Weaver, who entertained travelers in a log house s early as 1819, kept the first hotel. He secured a license in 1830. It occupied the site later occupied by the Waverly Hotel. The first church organization in Punxsutawney was the Methodist Episcopal. The Rev. Elijah Coleman, a local preacher of the Mahoning Methodist Circuit, Baltimore Conference, organized a class in 1821. There were forty-two appointments on the circuit and it took six weeks for the pastor to go around it. In 1824 the membership consists of Jacob Hoover and wife, Jess Armstrong and wife, Joel Stout and wife, Betsy Clawson and John Cary. During the first decade of its existence the Methodist class had no church in which to worship, but held services in the homes of the brethren and in Jacob Hoover's grist mill. The first Methodist church in Punxsutawney was a frame structure built in 1823 on the site of the Salvation Army barracks. About 1854 the little frame church was town down an a commodious brick edifice was begun on the same site. The new church was not completed until 1858, and during the interval services were held in various places, such as John Hunt's shop, Gaskill's store and in the old school house. The church met with financial difficulties in 1861. It was purchased by James E. Mitchell and by him deeded to the struggling congregation. The parsonage occupied by the present pastor, Rev. C.E. Miner, D. D. was built in 1844, the lot having been given for that purpose, by Mrs., James Winslow. The stone temple on the corner of Mahoning and Church streets was erected in 1899. The pioneer church edifice was built of hewed logs in 1826, and the first pastor was Rev. David Barclay, a Presbyterian. This church occupied the northwest corner of the Public Square. In 1836 a schism arose among Presbyterians over some point of doctrine and this congregation went over in a body to the Cumberland branch of that church. The first society was organized in the house of Dr. John W. Jenks, located on the site of the present City Hotel, with seventeen communicants. Rev. Charles Barclay was pastor, and Dr. John w. Jenks and Charles Barclay were the first elders. In 1868, the Cumberland congregation completed the erection of a brick church on the southwest corner of Mahoning and Findlay streets, under the pastorate of Daniel Cooper. In this commodious edifice the congregation continued to worship until 1902, when it was sold to the J. B Everhart Co., Ltd., as a site for the large department store. 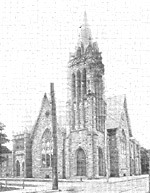 The old church was torn down following the construction of the stately stone edifice on the northeast corner of Union and Findley streets which was dedicated December 4, 1904, and since the union of the Cumberland branch with the regular Presbyterian Church, in May 1906, was known as the Central Presbyterian Church. The Reformed Church of Punxsutawney was founded in 1838 by the Rev. Mr. Allshouse. It was incorporated in 1846 and a charter granted to the German Lutheran and Reformed churches. In 1848 the congregation purchased on acre of ground from Dr. John W. Jenks for a consideration of $10 and erected a log church, members of the congregation doing the work,, the building and furnishing off which was accomplished at a total cost of $400. Prior to 1853 the old Lutheran and Reformed branches of the church worshipped together in harmony agreeing to disagree on the doctrinal points which distinguished them. But in that year came the Rev. Me. Brandt, a strict disciplinarian, who insisted upon exact conformity with the Lutheran creed. This caused a disjunction and the Lutherans withdrew and built a church of their own, which was begun in 1853 and completed in 1854. 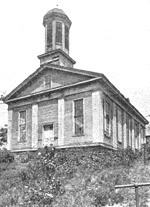 The Baptist Church of the Punxsutawney was organized October 30, 1840. Previous to the construction of the brick church on Jefferson Street in 1856, later occupied by Carl North's livery, the Baptist Congregation held services in the old school house on the Public Square. In 1904, during the pastorate of Rev. Charles H. Fitzwilliam, the old church property was traded to Henry Rudolph for a lot on the south side of the Park, which was dedicated October 15, 1905. 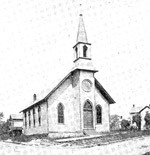 This church was organized October 7, 1853, under the name of the Martin Luther congregation. The corner stone of the present church building was laid November 10, 1853. Owing to the condition in those years, when the people of this community were poor, and all lumber had to be cut hewn and planed by hand. The building was not completed for almost six years. And the church was not dedicated until august, 1859. On the third of September, 1869 Father Herrmann Clement Weinker, then only twenty three years of age, and who came from Germany less than six months before, arrived in Brookville as assistant to Father Stumpe, where the first Catholic Church in the County had been built in 1854. In 1870 Father Stumpe grew tired of Brookville, and Father Weinker, who had gone to work to acquire a knowledge of the English language was assigned to Brookville as the pastor of the Jefferson County, and of the church at Red Bank, Clarion County. In the house of William E. Gillespie, in the spring of 187 that the first mass was said by Father Winker assisted by Father Stumpe. Thereafter Father Winker said mass once a month on a week day in Punxsutawney, first in the house of William E. Gillespie, then in a little building opposite the Clayville Foundry, and later in a room over Gillespie and Parson's store and from 1883 to March, 1887 in the hall above the store building of G.W. Porter. The corner stone of the church building was laid August 26, 1886, and the building was completed the following year. In 1890 Father Winker became resident pastor, previous to which time he had attended from Brookville. In 1904, Gather Weinker, having been made superintendent of the parochial schools of the Erie diocese, was transferred to the Eleanora Church in order to lighten his clerical labors, and Father John Link, formerly of Oil City, the present past, took charge of the congregation. In 1892, a parochial school build was erected, and in 1893, a convent was built and in 1895 rectory. In 1909, the congregation numbered about 800 English-speaking people. The "large foreign of the community" were provided for by churches at Walston, Adrian and Anita. 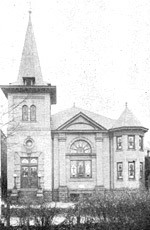 The Jewish congregation, Chevra Agudas Achim, was organized and chartered in 1886. The corner stone of the synagogue as laid September 30, 1900, and it was dedicated in December of the same year. 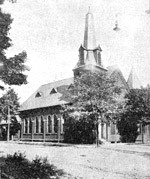 The first English Lutheran Church was organized December 9, 1888, with forty-three charter members. The corner stone was laid June 1, 1983, but the church was not formally dedicated until June 23, 1895. The Welsh Baptist Church, West End was organized in 1889 in the house of Thomas Gibbons, Horatio, by Rev John R. Jones. The Tabernacle Baptist Church was built during the same year. The Greek Catholic church, located in the West End, was organized in 1894 with the Rev. John Szabo as pastor. A frame church was built, and Father Szabo ministered to a large congregation from the first. In 1904 the little frame church gave place to a brick structure. The Grace M.E. Church, West End, was organized in 1897, by Rev T. W. Douglas, with twenty-five members, and the church now occupied by that congregation was built during the same year. The Fist church of Christ, Scientist, of Punxsutawney, was organized February 22, 1906, with 25 charter members. The movement began here as early as 1893, but there was no organized effort for the forwarding of the work until the year 1905, when services were held at the houses of the persons interested. The Episcopal Church has had an organization here for the past twenty years, services, being held at intervals by clergymen of that faith from other pastorates. In 1905, under Rev. W.N. Hawkins, a church was built on the south side of East Mahoning Street. The Episcopal Church Edifice was moved across the street to the corner of East Mahoning Street and Lane Avenue in July, 1909.
the Young Men's Christian Association of Punxsutawney was organized in 1891. it struggled along until 1895, and expired for want of financial support. It was re-organized in April, 1905 In October, 1907, a ten-days' building fund campaign was inaugurated and $50,000 raised for the construction of the fine YMCA Building. The Railroad Branch of the Punxsutawney YMCA was organized in 1907, the former offices of the R & P. Coal and Iron company having been purchased by the B., R., & P. Railway Company, remodeled at a cost of $10,000, and presented to the organization. The Adrian Hospital was founded by Mrs. Adrian Iseln, of New York, who gave $5,000 for that purpose, and the first hospital building was erected at the Adrian Mines in 1888. The institution originally intended to take care of men injured in the mines, soon became a general hospital. A new structure was completed November 1, 1898, the State having contributed generously to the building fund. This institution was founded by Dr. John E. Grube in 1900, and was located in the four-story stone building on Mahoning Street, above Dinsmore's clothing store. A new structure on Gilpin and Torrence Streets was completed in March 1908. Mahoning Bank.-The pioneer bank of Punxsutawney as the Mahoning Bank, which opened its doors for business June 24, 1870. In July, 1886, M. J. Dinsmore purchased the entire sock of the bank and became sole owner and in December of the same year he sold the bank to Dr. Joseph Shields, and retired from the business. The bank discontinued business in 1902. First National.-The First National Bank was organized August 7, 1883. Citizens Bank.-The Citizens Bank began business in 1890. In 1901, the bank was consolidated with the first National, the combined deposits being t that time about $250,000. Punxsutawney National.-The Punxsutawney National Bank was organized in January, 1901 and open its doors for business March 12 of the same year with a capital stock of $100,000. On July 8, 1909, the Punxsutawney National Retaining the official and quarter of the lat name institution, and increasing the capital stock to $200,000 absorbed the First National Bank. At the time of the consolidation to total resource of the Punxsutawney Nation bank were $2,150,000; deposits, $1,500,000 and undivided profits $260,000. Farmers and Miners Trust Company.-This institution began business December 5, 1901, as the Farmers' National Bank. The institution was reorganized in October 1907, as the Farmers and Miner Trust Company. In 1885 W. H. Tyson, initiated "The Spirit" Newspaper, and employed W. O. Smith as editor.. In August, 1904, the Spirit Publishing company was incorporated with W.O. Smith as president, and John P. Wilson, secretary and treasurer. September 17, 1906, the Spirit began the publication of its evening daily edition. The Punxsutawney Republican began its career in Clayville on August 25, 1894, when WE. Work established the Lindsey press. The plant was purchased by Clark Rodgers and Thomas J. Rodgers in February 17, 1899. It was moved to Punxsutawney in November of that year and the name changed to the Punxsutawney Republican. It was published by a stock company until October, 1900, when Thomas J. Rodgers, who has been connected with the paper since the first issue of the Lindsey Press was printed in 1894, became sole owner. The first great fire in Punxsutawney was on the night of June 3, 1879. It originated in the St. Elmo Hotel, A three-story frame structure, and spread in all directions, consuming the buildings on Jefferson Street and Farmer's Alley and Pine Alley, and the corner occupied by the Washington Hotel. The second disastrous fire occurred on the night of October 8, 1886, when most of the buildings in the three square constitution the business part of the town were reduced to ashes. The third destructive fire, and the greatest of all in the value of property consumes, occurred on the afternoon of August 23, 1900, when the business blocks on the north side of Mahoning street, between Findley and Pine ally were destroyed. The total loss was bout $115,000. The date of the big Findley Street fire, which destroyed nine building and damaged eight more, on the east side of the street, was September 15, 1903, which destroyed nine building and damaged eight more, on the east side of the street. The loss was about $68,000. Odd Fellows.-Laurel Lodge No. 672 was instituted in Punxsutawney, July 27, 1869, and was therefore the pioneer secret order. Lindsey Lodge No. 1012, Independent Order of Odd Fellows, was instituted in 1891. It owned the business block in which the hall was located. Masons.-John W. Jenks Lodge No 534, Free and Accepted Masons, was instituted March 9, 1875, in Shields Hall, over what was later Burkett's drug store. 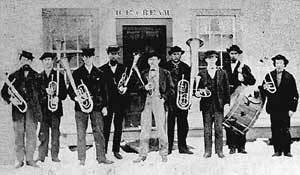 Punxsutawney's first brass band was organized in 1886, and continued its existence until about 1890. It was composed of the following members: W.B. Weiss, George Campbell, H.C. Bair, W.C. Torrence, F. Miller, D.S. Altman, O.H.Brady, J.P. Drum, W.M. Fairman, Conrad Farr, George Sterling, Alfred Frampton, J.D. Frampton and John. C. Smith instructor. The band was famous for many miles around. It owned a large bandwagon in which it traveled when employed by neighboring towns to play at fairs, big political demonstrations and other important occasions. The members were resplendent in uniforms glittering with gold braid, and wore large plumes on their hats. The plumes were secured surreptitiously one night when John Robinson's circus was in town. The following year, when Robinson's circus returned, and when the band connected with it circled in front of the City Hotel to dispense music, the proprietor of the show, who was standing in front of the hotel called in loud tones: "Be careful, boys; the people of this town like plumes!"